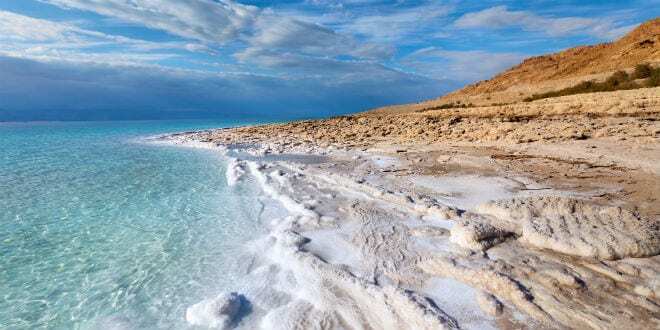 Almost ten times saltier than the ocean, nothing can live in the Dead Sea’s hypersaline environment – Or so scientists thought until recently. Scientific research has proved the existence of life at the bottom of the sea, but due to a unique set of circumstances, signs of life have begun appearing on its very shores, precisely as it is written in the Book of Prophets. A young woman on a nature hike was shocked recently when she discovered freshwater ponds with fish on the shores of the Dead Sea. Samantha Siegel, a Jewish woman living in Jerusalem, often takes trips to the desert and the ancient body of water. On a recent visit, she encountered an incongruous sight with powerful implications: a prophecy appearing before her eyes that seemed to contradict the laws of nature. The Dead Sea is, as its name implies, dead. More than 400 meters below sea level, it is the lowest point on dry land. No life can exist in its ultra-salty waters and its shores are coated with a thick layer of salt that kills any plant. Its inhospitality has been documented for centuries. A mosaic on the floor of a church in Medeba, Jordan, showing a map for Byzantine pilgrims on their way to the Holy Land, illustrates this. It features a picture of fish swimming down the Jordan River and then turning around once they arrive at the waters of the Dead Sea. The Bible, however, describes a very different picture of the region. Lot looked out on the valley where the Dead Sea is now and saw an incredibly fertile and well-watered region. The Bible relates that the landscape changed when the fire and brimstone destruction of Sodom and Gomorrah turned the valley into a wasteland. Indeed, people who visit the Dead Sea today would find it difficult to envision a garden in the arid region. Even more perplexing are the Messianic prophecies that water will flow east from Jerusalem into the Dead Sea, and these bitter waters will fill up with fish and the surrounding desert will be teeming with life. The water level at the Dead Sea has been receding at the fantastic rate of up to one meter every year. This is due to water being diverted from the Jordan River for agricultural purposes and evaporation caused by the Dead Sea mineral works. The dropping water level has led to sinkholes appearing on the shores of the Dead Sea. On a visit to the arid region, Siegel discovered that many of these pools have been filling up with sweet fresh water, and even more incredibly, fish. The proof is undeniable. Siegel produced a video in which fish are clearly seen swimming on the shores of the Dead Sea, and she films herself swimming in a large pool surrounded by green plants. Fresh water at the Dead Sea is a clear example of how the prophets were able to see things that remained hidden from scientists for thousands of years. In 2011, a team of researchers from Ben Gurion University in the Negev sent divers to the floor of the Dead Sea. This endeavor posed serious technical difficulties as the super-saline environment renders regular scuba gear inoperable. It was the first time such a dive had ever been made, and what they discovered was astounding. The researchers discovered huge craters on the seafloor, 15 meters across and 20 meters deep. Fresh water was flowing from these craters, which were carpeted with mats of microorganisms, showing that the Dead sea was not entirely dead. The beginnings of the prophecy are in place, waiting to spring forth.